According to the Disability Fact Sheet Handbook the average number of amputees living in the USA is approximately 350,000 individuals, with approximately 135,000 new amputations occurring each year with a ratio of 24 to 1 lower to upper body. Here in the United States, the most common causes of the lower extremity amputation are disease (70%), trauma (22%), congenital or birth defects (4%) and tumors (4%). If an amputation must be performed it can be classified into three categories: 1) Congenital - 60% of childhood amputations results from factors such as arrest of development (limb deficiencies), duplication, failure to differentiate, overgrowth, undergrowth, congenital constriction band syndrome & generalized skeletal deformities 2) Acquired - 40% of childhood amputations results from factors such as trauma (85% are one limb, 60% are lower extremity), farm machinery and power tools, vehicular accidents, gun shot wounds, rail road accidents, household accidents, thermal, childhood recreation & disease (15% due to cancer/infections) and 3) Acquired Adult Amputations results from factors such as peripheral vascular disease, diabetes, trauma-related injuries, cancer, infection & thermal injuries. After an amputation has been performed there are various factors to consider depending on the type of amputation. Such factors to consider includes: dealing with the psychological impact, promoting wound healing, addressing co-morbidities/concomitant injuries and addressing adaptive environmental issues. Quite often for an amputation, an orthopedic surgeon will do his/her best to salvage as much limb as possible in order to allow the best outcome for prosthetics and function. After the amputation has been performed post op dressings are applied which can include: 1) a rigid dressing made of plaster, 2) a semi-rigid dressing made with bandages and a paste compound or an air splint with plastic cover and 3) a soft dressing made of ordinary bandages, elastic bandages or an elastic shrinker. The type of dressing utilized will most likely be determined by the surgeon based on the surgery performed and other variables dealing with the patient's health, age, prior activity level and prognosis to achieve optimal function. The general role of the physical therapist is for him/her to work with the other health care team members to address the various factors discussed in the previous paragraph. The short term post-operative goals for the physical therapist should include: reducing or preventing post-op edema, preventing contractures and other complications, increasing strength in the affected and remaining extremities, maintaining/increasing cardiovascular capacity, assisting with the psychological adjustment of losing a body part, training for mobility/function and teaching of proper care of the residual limb. 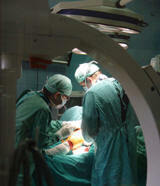 The long term post-operative goal is to help the patient achieve his/her optimal level of function. For more information on amputations and physical therapy please consult with your physical therapist or physician or visit the CyberPT Patient Message Board. For more information on an above knee or below knee amputations, click on the links from www.oandp.com: "A Manual for Above-Knee Amputees" or "A Manual for Below-Knee Amputees".